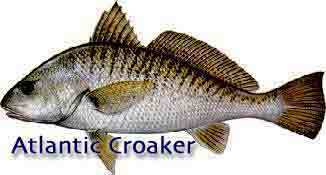 Information on Atlantic Croaker Fish Species. Description: inferior mouth; 3 to 5 pairs of small barbels on chin; silver-gray or bronze body with dark oblique wavy bars or lines; iridescent especially on head; preopercle strongly serrated. Similar Fish: spot, Leiostomus xanthurus (has no chin barbels and has a dark blotch on shoulder). older fish (2 to 3 years) inhabit deep OFFSHORE waters during the winter months and move into bays and estuaries during the spring, summer and fall. Size: usually less than 2 pounds. Remarks: during spawning becomes bronze or yellow in color; spawning apparently occurs OFFSHORE in fall; longevity 2 to 4 years.